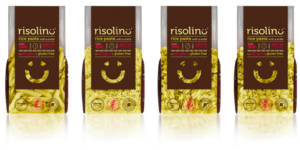 Be welcomed with a smile to the world of rice pasta RISOLINO. We are very glad for your visit and being interested at why is rice pasta such a good choice for you and your body. Rice pasta is becoming increasingly popular in homes and restaurants as well as school, public and staff canteens. It’s due to the several advantages this gluten-free pasta has. which unnecessarily burdens our digestion. Moreover, it’s free of preservatives, artifical colorings, cholesterol or any other adverse substances for our body. beneficial for your digestion. Due to the rice alternative you get better nutritional foods that give you enough energy needed to cope with everyday troubles. WHY WILL YOU LIKE RISOLINO? Rice pasta RISOLINO is produced only from the finest freshly milled long-grain rice, thereby gaining its softness and delicate flavor. Pure rice, natural tapioca starch and a pinch of salt. No preservatives, cholesterol or other adverse substances for your body. If the preparation procedure is kept, Risolino never overcooks nor gets sticky. It’s good for roasting and very comfortable to bite. Cook the pasta according to the package directions and then thoroughly rinse it with plenty of cold water. Take the chance to prepare for yourself and your loved ones the dish that satisfies more theirsenses. Thanks to rice pasta RISOLINO you get healthy and tasty variation of classic pasta with the great al dente and have the opportunity to take full advantage of your culinary skills.